The distinctive New7Wonders blimp hovers over the inauguration ceremonies in Puerto Iguazú as it makes its way from one of the New7Wonders of Nature, Iguazu Falls, on the Argentina-Brazil border. 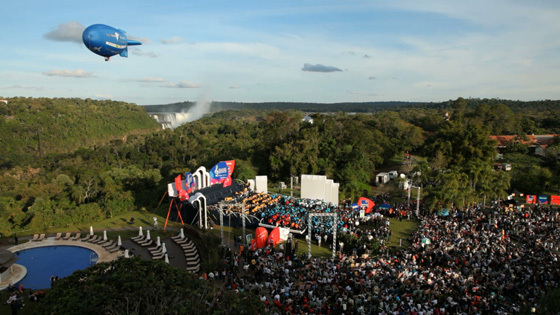 A huge orchestra comprising 700 children from seven Latin American countries, plus China and South Korea, played music from the soundtrack of The Mission as Iguazu Falls were officially inaugurated one of the New7Wonders of Nature. Conducted by double-Oscar winner Gustavo Santaolalla, the youth orchestra performance was one of the highlights of the ceremonies in Puerto Iguazú, which is located in the Argentine province of Misiones. 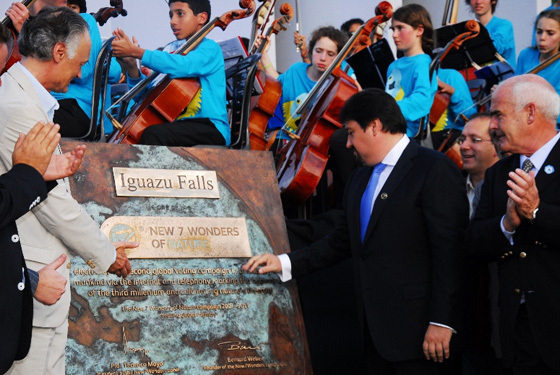 Founder-President of New7Wonders Bernard Weber (left) and the Governor of Misiones Province Maurice Closs (right) unveil the plaque listing Iguazu Falls as one of the New7Wonders of Nature. 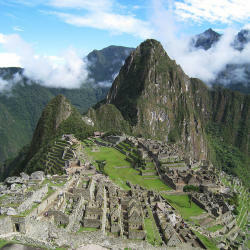 Speaking at a press conference in Puerto Iguazú, Bernard Weber said that New7Wonders is studying the feasibility of constructing museums of the New7Wonders of Nature and related theme parks around the world. “Estamos estudiando un proyecto de construcción de un museo de las siete maravillas naturales y queremos que en cada una de ellas exista un parque temático para que quien visite una pueda conocer las otras seis en miniatura,” he was quoted as saying by diariovasco.com in an article titled Las siete maravillas naturales tendrán un museo y parques temáticos. 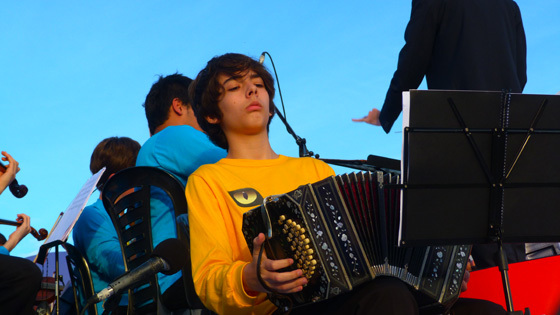 Young bandoneón player at the official inauguration of Iguazu Falls as one of the New7Wonders of Nature. 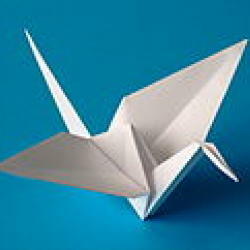 The bandoneón is a type of concertina particularly popular in Argentina. 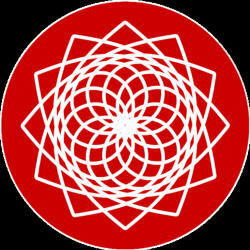 The first New7Wonders World Congress will take place later today in Puerto Iguazú. It will focus on how representatives of the seven elected sites can work to promote their tourism and development plans jointly. 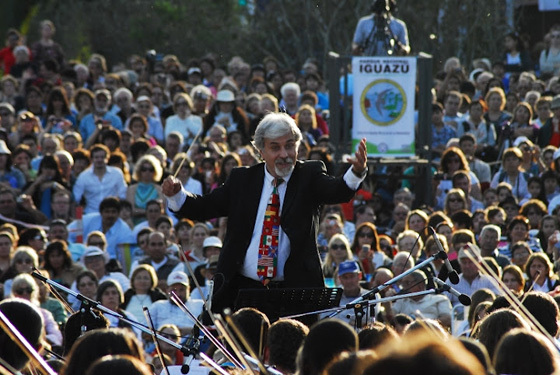 Gustavo Santaolalla conducting the youth international orchestra during the inauguration ceremonies in Puerto Iguazú, Argentina, marking the listing Iguazu Falls as one of the New7Wonders of Nature.